Mark Sonder Productions Inc. announces that after over 750 Performances in Pigeon Forge, this group is taking the rest of the country by storm. And that is why Nate Evans is in the Rock 'N' Roll Hall of Fame! Mark Sonder, MM, CSEP and the Chief Entertainment Officer at the award winning music and entertainment agency Mark Sonder Productions, Inc. is proud to announce that one of his exclusive clients, The Temptations Revue: A Tribute featuring Hall of Famer Nate Evans, will be performing from coast to coast on their 2014 Summer Tour. 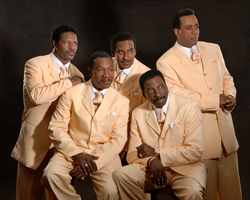 Call today to book The Temptations Revue: A Tribute featuring Hall of Famer Nate Evans on their 2014 Summer Tour at +1-540-636-1640.